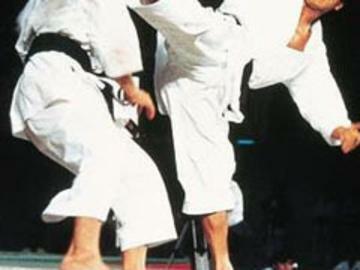 Azerbaijani karate fighters have won a clutch of 14 medals, including 9 golds at the world championship in Ukraine. Muhammad Allahverdiyev, Anar Soltanli, Umid Aliyev, Haji Mushfig, Royal Hajiyev, Elsevar Guliyev, Mushfig Abbasov, Teymur Guliyev and Aydin Dadashov climbed on to the winner`s rostrum. Orkhan Safiyev, Emil Yolchuyev, Mehman Huseynov took silver medals, while Turan Teymurbayli won a bronze. The Azerbaijani karate fighters also won two world belts out from three possible in a competition marking the 90th anniversary of national leader Heydar Aliyev. Azerbaijan ranked 3rd in the overall medal table of the championship.